Unlike standard gym equipment, the toning tables are power-assisted, which means that the exercise is done with the machine rather than using resistance against it. As a result, this is a low-impact exercise, suitable for people with conditions such as osteoporosis, mobility problems and joint problems. The toning tables are part of a range of activities provided by Ageless Thanet Feelgood Factory, on Margate High Street. 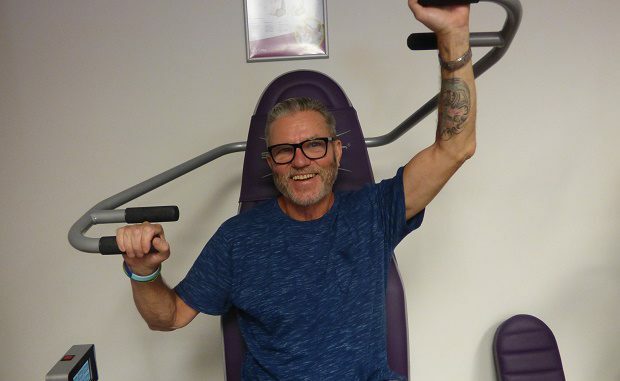 James Milsome, 67, who lives in Margate, has been using the toning tables for over a year. He said: “I tried the free month trial after my friend badgered me to go along. I had been going to the gym before I joined, but I had pain in my lower back and I found that I was unable to do things for myself like cutting my toe nails. According to a global study carried out by the Royal Cornwall Hospital in the UK, almost 1 in 10 people are affected by back pain, which becomes more common with increasing age. Ageless Thanet is keen to get more people physically active. Ageless Thanet have now launched their next group of free 8 week activities, due to start mid-October. There is a huge variety of different activities on offer, designed to reduce social isolation and loneliness, as well as helping you to get more active. Some of the activities on offer are: Boxing, Ballet, Art, Indoor Bowls, Quilting, Ukulele, Wood Turning, Tai Chi and more! To find out more about the free 28-day free trial of the Toning Tables or their free Wellbeing Activities, call the Ageless Thanet Feelgood Factory on 01843 296687.